Hurry over to Facebook and grab this rare $1 off one 16oz or 20 oz Diet Coke Coupon! You should be able to get a free diet coke with this coupon! This offer is valid while supplies last! It’s getting close to the end of the month so many of the coupons we’re seeing will no long be available. 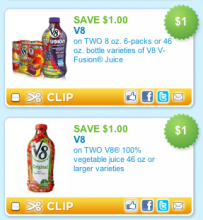 Coupons.com just released these three new coupons for V8 products. I don’t know if they’ll carry over into next month or not. Here’s the coupons that are available to print. This is a very rare coupons from Coca-Cola! Print this new $1/2 Coke or Dasani (20oz) coupon. This makes for very inexpensive beverages! You will want to print this Welch’s coupon quickly! Next week Walgreens will have Welch’s Sparkling Juice on sale, you can use this coupon to get a great deal!! Final price: 2 for $3 or $1.50 each! Make sure you grab the Walgreen’s ad on the way in so you have the Walgreens coupon! I just love sparkling drinks over the holidays! Become a fan of Vitamin Water on Facebook and they’ll send you a coupon for a free bottle of their Vitamin Water Connect. Offer limited to the first 100k.